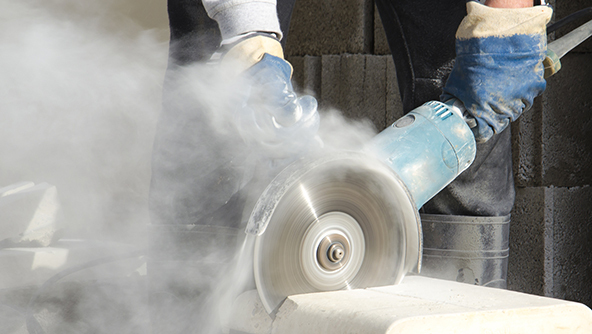 The OSHA final rule governing respirable crystalline silica calls for employers to monitor air quality and conduct exposure measurements in some situations. But how exactly should this monitoring be conducted? How frequently? What should employers do with the results? In this entry, we’ll try to answer common questions related to this requirement. Who needs to conduct exposure assessments? Both construction industry employers and employers in general industry and maritime can potentially be required to conduct exposure assessments if their workplaces expose employees to respirable crystalline silica at or above 25 micrograms — a.k.a. the “action level,” or half of the new PEL. A few specific construction tasks have built-in exceptions. Table 1 is a list of specific job tasks and corresponding engineering controls that, when followed, limit exposure to respirable crystalline silica. So for construction and general industry and maritime alike, the rule says that if you expect an employee could be exposed at a level of 25 micrograms per cubic meter (or greater), you must conduct an exposure assessment in that workspace. The exception is tasks from Table 1 in the construction section of the rule. Okay, it looks like my employee qualifies for an exposure assessment. What do I do? OSHA says there are two options — the scheduled monitoring option and the performance option. Under the scheduled monitoring option: OSHA says the employer can monitor “each employee on the basis of one or more personal breathing zone air samples that reflect the exposures of employees on each shift, for each job classification, in each work area” and re-monitor as needed. Essentially, under the performance option, the employer is saying, “I don’t need to go in and monitor the air in my employee’s workplace during their work because I already have equivalent data that’s just as accurate.” OSHA makes clear that this equivalent data can be challenged by an OSHA inspector, and it is our estimation that this is probably the riskier option. Let’s say I go with the scheduled monitoring option. OSHA provides a pretty straightforward “if/then” guide for how to proceed. If the initial monitoring indicates that employee exposure is below the action level — again, 25 micrograms, half of the PEL — then you can stop monitoring that employee. As long as the employee’s work conditions stay the same, you never have to monitor again. If monitoring indicates employee exposure is above the PEL, you need to conduct another monitoring within three months. OSHA makes clear that you are required to reassess each employee’s exposure whenever there’s a change in “production, process, control equipment, personnel, or work practices.” However, reassessing doesn’t necessarily equate to re-monitoring. For example, a change in the workplace could eliminate an employee’s chance of being exposed to silica dust entirely, therefore, there wouldn’t be any respirable silica dust emissions to monitor. Where do I go for information on the technical aspects of the monitoring itself? Do I have to tell my employees the results of their monitoring under the scheduled monitoring option? OSHA says you have to tell employees within five working days of receiving the results yourself if you're in construction, and within 15 days if you're a general industry or maritime employer. OSHA says you can provide the written results individually, or “post the results in an appropriate location accessible to all affected employees.” The key is that the results are in written, not verbal, form. What if an employee — or a representative, such as a union rep — wants to watch the monitoring process under the scheduled monitoring option? OSHA says you have to let them. You also have to provide that observer with PPE to wear during the observation (if they need it) free of charge. So let’s say you have two workers, A and B, at your facility. Only Worker A is exposed to silica dust in his/her work area, and requires monitoring. In this case, you don’t have to let Worker B observe the monitoring process if he/she asks to do so; only Worker A has that right. What if OSHA conducts its own exposure measurements at my workplace, and those measurements disagree with ones I have previously taken? In short, it will be up to the inspector regarding how to move forward. What if I instead choose the performance option? In choosing this option, you are essentially making the case that you can present OSHA with information that will show you have good evidence that you know as much about your employees’ exposure to silica dust as you would under the scheduled monitoring option. OSHA says you can use this option whenever you have “any combination of air monitoring data or objective data sufficient to accurately characterize employee exposures to respirable crystalline silica.” Your sources can be previous air monitoring, or simply other information about silica exposure in your facility. However, the key is that this evidence must be as compelling as the results of scheduled monitoring would be. Is there an example of how OSHA sees the performance option being used successfully? So even in its own example, OSHA will only say that following this model “may” allow NADA body shops to achieve compliance through the performance option. It seems OSHA is hinting that the performance option will always involve greater subjectivity when it comes to whether an employer is compliant or not. What if the monitoring results or data I use under the performance option were taken a long time ago? So, OSHA is saying you can present an inspector with results taken long ago, but it will also be up to you to convince the inspector that the covered employee’s workplace and work has remained substantively unchanged since then. What if I am using the performance option, and an employee’s work or workplace changes? In that case, just as under the scheduled monitoring option, you’ll have to reassess whether or not you’re still compliant. What if want to use the performance option, but I’ll need to see my workers in action before I can be 100% sure their situations are covered by previous data? In this case, the performance option is probably not appropriate for you. So you can’t observe your workers working for a while, and then decide if their work is analogous to a previously-monitored situation. You have to be able to make that claim going in. Whatever option I select, if I conduct exposure measurements, will I need to keep a record of them? What if I am using the performance option, and I’m relying on data I didn’t gather myself? In that case, OSHA says you still have to keep a record of any data you will rely upon to comply with the requirements of the rule. What does OSHA say about using an electronic solution to comply with the recordkeeping aspects of this requirement? In the rule, OSHA makes clear it is very open to the use of an electronic solution for satisfying the exposure measurement and data recordkeeping requirements. The cloud-based EHS Management Platform from VelocityEHS can provide a central platform from which to manage your EHS responsibilities, and document, track, and report on required information surrounding exposure assessment requirements. You can catalog and analyze employee tasks that qualify them for monitoring, allowing you to better demonstrate compliance, and easily access information related to previous monitorings. In addition, administrative features allow you to quickly and easily notify employees when and where monitoring may be required, and create automatic reminders for when exposure assessments are due to recur. Click here to request a demonstration of these features.